Oversleeping, fatigue, lack of interest in daily activities, feeling tense and anxious, low mood are all symptoms of depression. Seasonal affective disorder (SAD) occurs throughout the winter months as the days get shorter we are reduced to exposure of sunlight. Lack of sunlight can affect the hormones melatonin and serotonin and play havoc with our circadian rhythm. There is such a thing to the winter blues, SAD sufferers tend to suffer from depression the same time of the year and feel better usually the beginning of spring. There are treatments for seasonal affective disorder, antidepressants may be used but there are natural alternatives, counseling and therapies such as CBT might be suggested by your doctor depending on how severe the depression is. 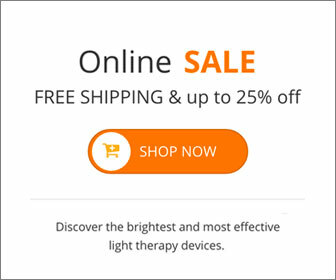 Light therapy is a treatment for seasonal affective disorder. A light box is specially made, and exposure to artificial sunlight may relieve symptoms by changing the chemicals and hormones in the brain. There are a few light boxes on the market, but essentially you’re looking for the best in light intensity, price, design and safety. Watch the difference in mood by exposing yourself to the light, 15 minutes to an hour a day is all that is needed. It is literally your HAPPY light. This entry was posted on Wednesday, April 24th, 2013 at 9:38 am	and is filed under SAD. You can follow any responses to this entry through the RSS 2.0 feed.